Or you can lock your bike at the “country” station, and be reasonable sure it will still be there 5 days later. One other thing about bikes on Metro-North… check the paper or PDF timetable to be sure bikes are allowed on the train you want to take. They are never allowed on peak-hour trains; but some off-peak reverse-commute trains also prohibit bikes. 8 miles which wayish (EWNS)? If you still have some fred in you from your younger days you could just bike there from the city. This would be on the way, so if it’s been raining you could see if your mud flaps are up to the little river there. Then enjoy that most of the rail ROW is still intact and a paved MUP north of the city. Does Katonah still have an ice cream shop nearish to the train station that freezes ice cream with liquid nitrogen when you order? It was refreshingly cold and amusing to see after a ride up there on a hot day a few years ago. If they’re personal vehicles, they’re parked illegally. Should we enforce parking so people can’t park illegally? Sure. Different conversation. I doubt it. I think the half life of a bike chained up on the street is 30 minutes. Bike still in 1 piece https://uploads.disquscdn.com/images/612584671044e10824ed4b110dcee2b0a914a04cb2713c591e73a6bd309a584b.jpg https://uploads.disquscdn.com/images/7041cb7008ac3830c3368f72e554fd9c764ed2b3ba9c579290b1a68f6a3aa656.jpg after 5 days and 4 Nights ! I’m amazed! No parts missing which is the least I might have expected. it was double locked with 2 of the cheapest U locks from Target. Normally I only use One U-lock. Andrew, I am not sure what proposal you are talking about. Sorry if I wasn’t clear. I was referring to your proposal (which I thought, apparently mistakenly, you were alluding to) to have separate pedestrian-only crossing phases and to disallow turns while pedestrians are allowed to cross. My post does not include any proposals but rather today’s reality. On an avenue there is a crossing every 200 ft , the length of a block between two streets, and therefore a signal. Well, yes, north-south blocks in Manhattan are quite short (closer to 264 feet, actually), which I think is generally considered to be a good thing for pedestrians. The pedestrian green cycle is way shorter than the car green cycle . Because you’re not including the pedestrian clearance phase (blinking red hand), when pedestrians are still allowed to cross. The pedestrian white man plus blinking red hand phases last almost exactly as long as the motorist green plus yellow phases (usually a few seconds less, unless there’s an LPI, in which case it may be slightly more). I can show you many many crossings where the pedestrian phase is shorter than the car phase. and yes I do include he clearance phase. A conversion of car space to bike space may typically calm traffic, and I have no objection to most such proposals. The same certainly can’t be said for a conversion of a pedestrian space to bike space. Think of park paths that are used by both pedestrians trying to enjoy their surroundings and bicycle commuters trying to get where they’re going as quickly as possible – there is no single “common good” in such a setting. It’s not the “bicyclists’ interests” that help uniformly; it’s the reduction in space allocated to motorists. Yes, we have alluded in different posts to separate pedestrian only crossing phase, which is the ONLY way to ensure pedestrians crossing the stret, with the walk signals, do not have to “negotiate” a conflict with a 2 ton- vehicle in motion who has a green light at the same time. Through the walk signal the city is telling pedestrians ” you are safe to cross”. They are not safe , they are getting killed by left turning cars. 8 of them in my neighborhood. 2 of them on my street. By more than a few seconds? Are you referring to intersections with exclusive turn phases? As an example, Just yesterday crossing the south leg of 11th avenue at 34th street, I got 10 seconds. in fact the countdown clock starts at 4 ! Yes, that proposal. The law requires motorists making turns to yield to pedestrians crossing legally in the crosswalk. Why do you assume that motorists who currently ignore that law would wait at red lights that protect pedestrians? I’m certainly not willing to make that assumption – at other red lights that only protect pedestrians, compliance is pretty pathetic. Read my concerns in more depth in my Friday evening comment. I’m not disregarding your concern – on the contrary, I share it. I’m just worried that your proposal could potentially make matters even less safe. An intersection with an exclusive turn phase, as I suspected. The more phases you cram into a 90 or 120 second cycle, the shorter each one will be. I appreciate where you are coming from . What counts are not the behaviors but the results . 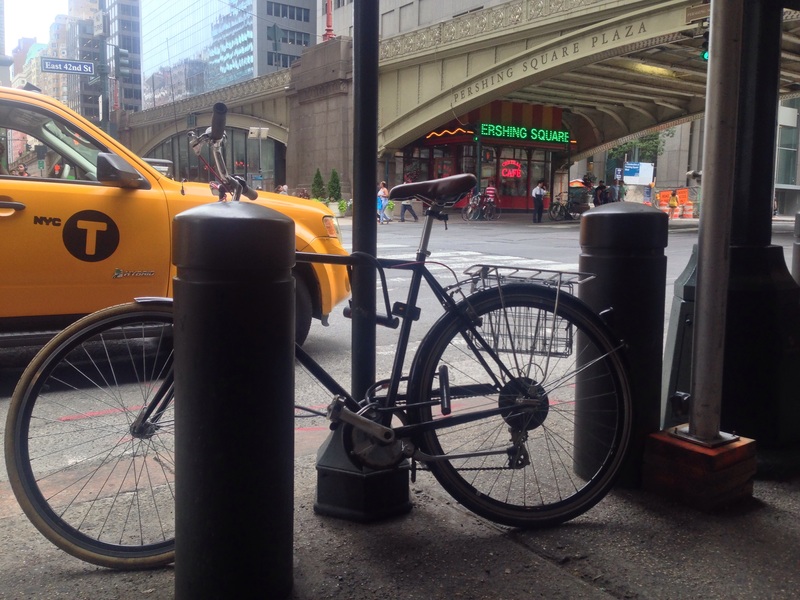 the DOT has published results for bike lanes and a study was done of 68 intersections in NYC. in both cases crashes are significantly decreased, bike lanes with split phase are 40% safer ; crashes are reduced by 77% in the study . In 1922 police commissioner saw that cars going in the intersections from avenue and streets at the same time was causing too many crashes. they invented the traffic light . Still nearly 100 years later we give the green lights to cars and pedestrians at same time. It is unreasonable to expect from a motorist to have a green light and to stop . These are mutually exclusive signals to the brain. As far as red lights and green lights, in the case of cars, as a pedestrian my non scientific observation is that the red light compliance is better than stopping at green light for pedestrians ? even if there is a small difference, I will take it because my neighbors are getting killed. thank you for your thoughtful answer. I really appreciate. The more you frustrate street users by asking them to stop and wait constantly the more likely they’ll be to just ignore traffic controls, essentially undermining the system. As things stand now, traffic signals are pretty much ignored by cyclists or pedestrians unless there is so much cross traffic that they can’t physically pass a red light. Compliance by motor vehicles isn’t exactly steller, either. Traffic signals make it safe for motor vehicles to go fast. That’s about the only thing they reliably accomplish. For pedestrians and cyclists, everything about them is a negative. All they accomplish is giving cops an excuse to ticket jaywalkers or jaybikers. We should be campaigning to actively remove traffic signals, not add more phases to them, or add yet more signalized intersections. Look instead at what Europe has do. You rarely see stop signs there. Traffic signals are used far less frequently, mainly at intersections with uncorrectable poor lines of sight. Whenever there are split phases, there are significantly less crashes and injuries . Bike lanes are 40% safer according to DOT and a study of 68 intersections show a 77% reduction in crashes . Europe: The last time I was in Paris I stepped off the sidewalk as we do in New york to wait for the walk sign – the driver Immediately stopped even though he had the green light. The culture makes people infinitely more respectful of pedestrians . They value people lives over there. we have to decide if we are serious on decreasing fatalities and injuries and if we are ready to make the tough decisions, reclaim space and time from cars. We need to focus on people who respect the law and make sure they are safe when we tell them they are and we are not doing that. 8 people were killed in my neighborhood , 2 on my street all in the pedestrian crossing with the walk sign by turning cars..
have you ever ridden Route 202/35 in Northern Westchester ? no exclusive phase there . There’s an exclusive left turn phase from westbound 34th to southbound 11th. The east-west pedestrian signals on the south side obviously have to be red when the left arrow is on – but westbound through traffic can proceed whether or not the left arrow is on, since it doesn’t conflict. So westbound vehicular traffic by necessity has a significantly longer green phase than east/westbound pedestrian traffic on the south side. I regret to inform you that cars nearly run me over every day, at all types of intersections. A better answer is more stringent driver licensing, far fewer cars, and prohibiting more turns. Left turns should be prohibited altogether in NYC. They’re the cause of many pedestrian fatalities. Right turns should be severely restricted or even prohibited at pedestrian-heavy locations as well. there is no red arrows to allow pedestrian to cross while protected. to sit is even worse, cars have a dedicated arrow to turn but pedestrians have very little time and no protection. What is wrong with this picture? I regret that cars nearly run you over everyday and you are ready to accept it. Don’t be so smug about people’s life . joe – correct, engineer streets for safety & remove many signals. #1: Bike lanes and crosswalks are different things. Bicyclist traffic and pedestrian traffic have different characteristics – and they have vastly different volumes. So if you want to use a bike lane study as your basis, you still need to make the case that the results can be extended to crosswalks. It’s not obvious to me that they can be. Basic traffic signals protect against straight-ahead right angle collisions, both car-car and car-pedestrian. They don’t protect against turning collisions. Motorists turning left are required to yield to conflicting oncoming traffic in exactly the same manner that motorists turning (left or right) are required to yield to pedestrians (and cyclists). This isn’t just a loose analogy – the exact same clause in the New York City traffic code requires both (“But vehicular traffic, including vehicles turning right or left, shall yield the right of way to other vehicles and to pedestrians lawfully within the intersection or an adjacent crosswalk at the time such signal is exhibited”). There are some traffic signals with arrows, so that motorists can turn left without yielding at intersections with especially high turn volumes. (You encountered one at 34th and 11th – it left you with a short pedestrian phase and you nearly got run over.) But they are the exception – most signalized intersections don’t have arrows. Nonsense. Any motorist making a left turn off of a two-way street has to wait for oncoming traffic. If that same motorist doesn’t also wait for pedestrians, it’s either because he doesn’t know that he’s supposed to (so let’s educate him until he learns) or because he doesn’t care (so let’s ticket him until he starts to care). As far as red lights and green lights, in the case of cars, as a pedestrian my non scientific observation is that the red light compliance is better than stopping at green light for pedestrians ? At a standard run-of-the-mill red light, sure – because running a standard red light would also endanger the light-runner’s life. I’m referring to red light phases that protect pedestrians only. Not at all a scientific observation, but I’ve seen a lot of drivers lately who simply ignore them. Vastly increase their number across the city and watch even more drivers ignore them. even if there is a small difference, I will take it because my neighbors are getting killed. What if the difference is in the opposite direction, and what we have now is actually safer? Again, have you spoken with a competent traffic engineer about your proposal? there is no red arrows to allow pedestrian to cross while protected. I didn’t say there was. I said there was an exclusive turn arrow. It’s an extra phase on top of the usual two. The more phases you cram into a 90 or 120 second cycle, the shorter each phase has to be. The reason the pedestrian phase is so short there is that there are three phases rather than two. to sit is even worse, cars have a dedicated arrow to turn but pedestrians have very little time and no protection. What is wrong with this picture? A lot. I wish we didn’t have the turn phase, so that pedestrians would have more time to cross. I regret that cars nearly run you over everyday and you are ready to accept it. Ready to accept it? It makes me furious! Don’t be so smug about people’s life . OK lets go watch the fireworks ! On 8th Avenue, I think it would be better to turn the bike lane officially into a sidewalk extension. The bike lane is unusable. The sidewalk is unusable. The only reason I grudgingly ride on that bike lane when I happen to be in the area (and a two long block detour isn’t worth it) is the worry of getting a ticket if I don’t. I like protected bike lanes, but this one just doesn’t work. Of course, it would be nicer to extend the sidewalk and add a bike lane by taking a car lane, but that’s a harder sell. Until something like that can be achieved, like Spock said, the needs of the many pedestrians must outweigh the needs of the few cyclists (or something like that). I also walk on 8th Avenue sometimes, so I know the pedestrian perspective firsthand too. 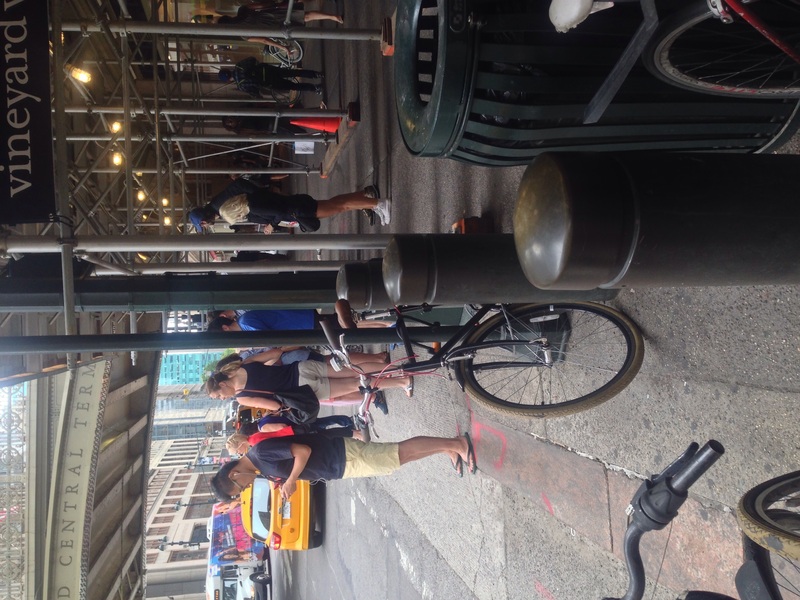 MTA deserves to lose the ADA lawsuit. It’s obvious they could have put elevators in at Middletown Road. Hell, I’m not even an architect, and I could design them.